Should people be so hasty to leap to conclusions about the Copeland by-election result? Perhaps. Reaction to the results of this week’s political events in the United Kingdom prove that the left can do denial, and trade in alternative facts, just as easily as the right. In my own mind, the result in Cumbria doesn’t signal the death of the Labour movement but I think it does hammer yet another nail in the coffin of the idea that the current leadership can ever hope to win a General Election. For all that it’s an awful result, one has to keep in mind that this is a geographically remote constituency where 10,000 jobs and local services utterly depend on a single source of economic activity: the Sellafield nuclear plant. Corbyn’s personal antipathy towards nuclear energy, combined with all the other issues he faces with his personal popularity as Labour leader, made this a difficult campaign even in a seat that Labour has held for generations. If you wanted to find a location for the complaint, ”Nobody down there cares about people up here”, Copeland is perhaps the archetype. But what does it signify as an existentialist harbinger of doom for the labour movement as a whole? Here, not as much as has been credited. The Brexit vote proved that working-class people are frustrated and angry, willing to protest at what they perceive as the neglect of Westminster politicians regardless of ideology. Now, it may seem utterly illogical that one of the ways to complain about current government policy is to cast a vote for the current government, but I think you can hear this in the responses of people who I heard interviewed before and after Thursday’s by-election. Many voters said that they despaired of Corbyn and that on the basis of the local issues most important to them – Sellafield – the Conservatives offered a safer, rather than a better, pair of hands. So whilst that’s a terrible indictment of the current Labour Party, I don’t believe it signifies Mrs. May is leading a movement that is transforming working class attitudes towards her party. In my view, the result in Cumbria warns in the starkest terms that Labour has to change to regain the loyalty of its traditional base. In interviews, Copeland people say repeatedly that although they may be lifelong Labour voters, they feel the party is heading in the wrong direction, under the wrong leader. The danger is that the leadership still doesn’t want to believe what people are telling. Almost two years into the Project Corbyn and the grand design is still so poorly articulated and understood that his party loses a seat like Copeland. And yet the response from loyal lieutenants and advisers is almost worthy of a Melissa McCarthy / SNL sketch about Sean Spicer. Just because voters would rather die from hospital closures than back Labour, it’s no cause for concern. If Copeland had been the only election taking place on Thursday, the sense of despair could have been abyssal, but fortunately there were two campaigns running in parallel this week. And so, I reach this conclusion about the issue being with the party, not the movement, because of the by-election in Stoke Central. Here, in a constituency regarded as Brexit HQ, Labour defeated both the Tories and Ukip to retain a seat that many right wingers felt would be a totem for blue collar conservativism. When it matters, when there is no massive local weighting factor like Sellafield, most working people still associate with Labour. Ukip’s appeal, like so much of its policy agenda, seems greatly over-exaggerated. But although I don’t think the heartlands are moving towards the right in terms of deep principle, that isn’t to say it can’t happen or that Labour supporters might not, in the end, find a different home, be that in the Liberal Democrats or a new, centre-left, social democratic movement. Stoke and Copeland highlight Labour’s dilemma of trying to be the main opposition party on the established political front line whilst being embroiled in unreconstituted, guerrilla skirmishes with Ukip at the rear. I think the party is placing too much emphasis on winning these small battles whilst losing site of the objectives of the war. This misguided approach – if it continues – could see Labour lose national relevance. In short, as John Curtice wrote recently in The Guardian, Labour needs to become a Remain party to have any chance of defeating Theresa May at the next election. I know some readers will feel that the outcome of the June referendum, especially in the North of England, make this the last thing Labour should do. But my personal interpretation of Brexit outside of the Tory shires and suburbs is that the referendum result was a protest similar to the Copeland by-election. Most ordinary people are not ideologically opposed to the EU like Jacob Rees Mogg or Bill Cash. It is British, Conservative, United Kingdom government policy that has made their lives difficult: austerity cut backs in crucial public services and benefits and the emergence of a low wage gig economy with all the wage and benefit uncertainty it brings. Immigration, although helpful to the wider economy, exacerbates these local pressures when money is tight and opportunity seems scarce. I believe that most working class voters were rejecting David Cameron when they voted Leave. A politician they disliked, representing a government they did not vote for, and in the absence of meaningful Labour support for Remain, it’s no wonder so many voted against the status quo. In making the case for Remain, Cameron could hardly criticise his own government, and the Labour leadership was pretty absent from the debate. The only leaders to make effective cases for the EU were Tim Fallon, Ruth Davidson and Sadiq Khan, none of whom appeal greatly to voters in Hartlepool or Mansfield. Now Labour is in serious danger of making a mortal error by continuing to side with the Conservatives over the outcome of the flawed referendum. Instead of passively accepting the result, it should be passionately laying siege to Theresa May’s government because of the causes that underpinned Leave. The NHS is a state of crisis. Local councils face the most brutal cutbacks since the 1930s. The party should be increasing its majorities by crushing margins. And yet it’s completely failing to make ground. Has it forgotten that most of the people who voted for it in 2015, including in the North and Midlands, voted to Remain? None of these people are going to vote Ukip any time soon, as Stoke Central shows. And why might people who did vote Leave be as worried about immigration as the Daily Mail wants us to believe? It’s not because they are all bigots and racists (though undoubtedly these exist) but because they have very human and understandable concerns about absorbing newcomers in the face of chronically scarce resources and limited career prospects outside of zero hour, low paying jobs. Immigration is extra fuel for a fire that has been fanned into a blaze by Conservative decisions and policies. Take the fuel away by leaving the EU and that fire will still burn. All of these things can, and should, be getting laid squarely at the feet of the government. But Labour is completely failing to make that case. This has nothing to do with parliamentary Labour disloyalty or external criticisms of Jeremy Corbyn. Corbyn has had time and enough to make his case to the country. Outside of Momentum, no one is listening, or rather, they are listening in despair and wondering what they have to do to wrest the party back from an ideological movement to a pragmatic political force that is relevant to the working class. Maybe voting for a Tory in Copeland is enough. Personally, I doubt it. Stoke Central confirms to me that Labour can still be a party of ordinary people. But to assume that position, it has to stop trying to maintain the impossible position of being with government policy over the Leave campaign and against government policy in everything else. It has to reframe the Leave vote for what it should have been seen as: a vote against Conservative austerity, not a vote against Europe. It has to call out Ukip as being intellectually, as well as morally, wrong and be brave enough to try and explain why leaving the EU will not solve the things that ordinary people really care about. Thanks to Cameron’s folly, Britain’s relationship with Europe has become the single most important issue; the obsession of a handful of wealthy tycoons and Conservative MP’s, who another Tory Prime Minister once called “the bastards in the shadows”, has been inflated out of all proportion to its relevance. 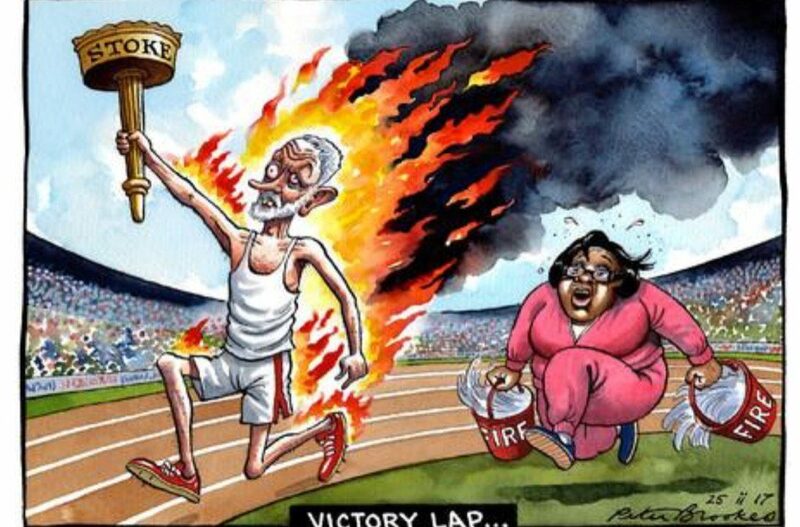 The problem, for Labour, for all of us, is that just at the point when the party and the country need maximum clarity, Jeremy Corbyn is in charge. Labour should be pointing out, daily, loudly, that no one voted for Theresa May or her entirely subjective opinion on what Brexit means. Instead, it proclaims ‘victories’ over the small print in the Article 50 Bill that are barely visible, let alone understood, on Cumbrian doorsteps. Whatever the virtues of his principles, Corbyn is incapable of galvanising them in others. People talk about the bravery of his convictions but it’s one thing to be brave as a minor, idiosyncratic backbench MP, quite another to be brave as a party leader on the national stage. The kind of courage Labour needs now is to face down the pseudo-orthodoxy of the Brexiteers and right wing press. I don’t believe Jeremy Corbyn can do that. I don’t believe he wants to do that. One man who did, Tony Blair, is entirely the wrong messiah for these times but, and in no way excusing or glossing over his Iraq mistakes, he has the right message about Brexit and Labour’s route to electoral relevance. Labour should be a Remain party. It will be hammered by the Mail, the Express and the Murdoch newspapers for trying, but in truth, what’s new about that? Since the Referendum, those forces have revealed so much of their true colours that I think a coherent, well-argued, Labour Remain movement would actually get a much more sympathetic hearing from the electorate. It will be opposed loudly by an obnoxious, over-confident government, comprised of too many ministers, formerly pariahs in even their own party, for whom Brexit opened a door of golden opportunity that they have seized with the fervency of coup plotters. Nevertheless. Once you start attracting the full ire of a hostile right wing press and their cabal in the Cabinet, you know you are on the right track. The sad thing now is that the Tories barely even need to try. And they’ll win a crushing majority at the next General Election, still not having to try, unless something changes now. Hurting the thing you love is the last resort of desperation. I think this is where Labour now stands.